This Friday, 22nd Feb, sees us enjoy the annual club dine-and-bowl at Arena7 in Letterkenny. Our meal is booked for 8pm with bowling to follow. If you fancy joining in the fun and laughter contact Marina on 086 8216335 to book a space at the table. Saturday brings the final meet of the Donegal Harriers in Creeslough. This is always an excellent day of sport and if you’ve had a days hunting on your bucket list for a while then you should contact them and book in as a visitor for the day. The following Friday, March 1st, Cliff is organising the second flatwork lesson with Mary Devine. The first of these was held last Friday and was very enjoyable and beneficial. Contact Cliff if you wish to book in. Apologies to everyone for the lack of a report on the first leg of the spring league. We now have two legs under our belt (wonky ones in some peoples cases….isn’t that right Hazel?! )and the competitors who made the journey to Drumanoo Equestrian on Sunday were treated to a very warm welcome by both the host club, the Tirconails, and the host family the Vials. The weather gods were in a good mood and whilst it was blustery it was still dry and enjoyable. Hot food helped keep the chills at bay and a challenging course gave the riders plenty to think about while the spectators were well entertained. Our own club had just two representatives at the second leg, namely Francis and Rachel. Francis and Bonzo saved their best work for the training rounds while Rachel and Merlin built on their first leg success by recording the only clear round in the Advanced Intermediate class and bagging the red rosette. Results and the overall league table are available at the following link. Remember that the league aint over till the fat lady sings so saddle up and join us on March 3rd in Greenacres Equestrian Centre, Convoy. 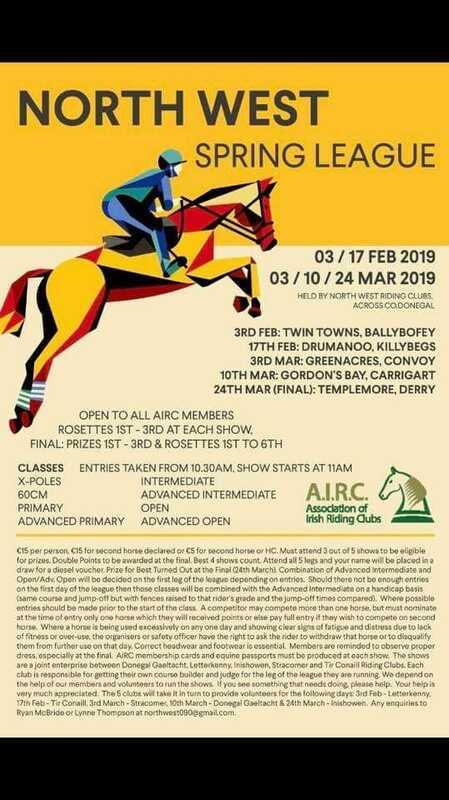 Welcome to the 2019 edition of Letterkenny Riding Club, complete with challenging competitions, sociable shenanigans, enjoyable events, fantastic friends, hilarious horses and inevitable inebriation (purely drunk on fun and emotion). As some of you will have heard we have to offer get-well-soon wishes to our hard working secretary Hazel, who is currently sending you riding club updates from her hospital bed on the wrong side of the Atlantic as she recovers from a very nasty broken leg. No doubt her trusty steed Darcy will be only too delighted to enjoy an extended winter holiday. Also on the recuperation bench is Donegal Gaelteacht member John McDaid, who landed wrong when coming off on the hunting field and is now waiting for four vertebrae to knit before he can return to the saddle. Cormac must be feeling like something of a trend setter at this stage as the competitive ranks of the clubs get decimated! No doubt we’ll see you all back fighting fit before the year is out. Those who are still able to throw the leg will be glad to see a small stretch in the length of the days now and can look forward to the start of the spring league at the start of February. Dates and details are on the poster below and as you can see the league has received a big shake-up this year as the different legs are in different venues. This should create a very different dynamic and will make for an interesting and challenging league. 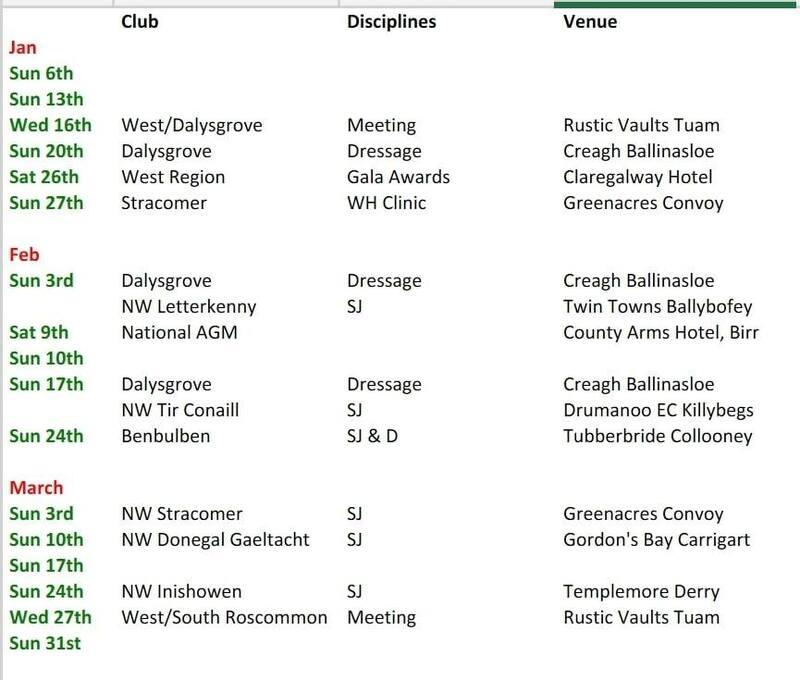 If anyone is interested in travelling farther afield over the late winter or early spring then they might like to support our neighboring Western region clubs by attending some of the following events. Our own North West Riding Clubs meeting is being held this coming Monday 14th January at 8pm in the Glencar Inn. As always everyone is encouraged to come along and get involved in what is happening in the region.